I felt really lost in the days leading up to and in the days following Trump’s inauguration. Between confirmation hearings, Make America Great Again hats, protests and Twitter trolls, I was overwhelmed with rage, sadness and profound disappointment so much so that I didn’t want to march or protest or even talk about the election. All I wanted to do was curl up in my bed and watch cartoons. In times of intense emotional exhaustion, it’s helpful to look to my activist ancestors who have fought similar battles for guidance. Thankfully, I got to meet one of the baddest and boldest of the OG activists in person. Angela Davis, freedom fighter and boss Black Woman, graced DC with her presence during inauguration weekend. She stopped by our local hotspot, Busboys and Poets, for an intimate conversation with Melissa Harris-Perry about what we’re all feeling and what we all need to do. I was lucky and blessed enough to be in that crowded room to pick up all of the gems she was dropping. Here are 7 of my favorite quotes, the ones that shook me up and woke me up to take my place in the march toward a better future. Davis mentioned that the moment in her life when she felt the most fear was when she was facing a death sentence during one of her numerous times in jail. Her friend and comrade James Baldwin wrote to her and said “If they come for you in the morning, they’ll be coming for us that night.” Davis was comforted knowing her potential death would not be in vain. She was supported by numerous other activists. She was not and would not be alone. With this in mind, Davis was willing to face death to be on the right side of history. Davis looked back on a moment before the Women’s march when she was asked the questions above. Like her, I believe my Blackness defines my experience as a woman, my womanhood informs my experiences as a person of color. I cannot separate these parts of me and why should I? I represent the intersections that have yet to be prioritized in this feminism movement. But with the help of more Latina, more Native, more Queer, more Asian women standing firmly in their truth and their identities, maybe we can pave a way for a more inclusive fight for women in the future. The lesson: Be you, the whole you. Asserting your humanity is not divisive. It’s necessary. Davis talked at length about the last presidential election and was critical of both candidates. After Hillary “clenched” her historic nomination, there was a lot of talk about shattering the glass ceiling. But I didn’t feel like I had broken through anything. There was nothing special to me about a white woman who’s had privilege and access most people could only dream of climbing the ladder and getting a promotion. While there are still Black, Latina and queer women who have yet to reach half of the heights that Hillary has scaled, we must understand that for most of us, the glass ceiling is still intact. The lesson: Progress ain’t progress unless I’m bringing others with me. Davis said these words to inform white Americans that they don’t have to relate their skin color to racism. They can choose to fight against it and they have to work hard to do so. But it was also a reminder to me that I have allow them join that fight. I have a hard time trusting white allies and activists. While their intentions may be pure, in my imaginings, they always have an exit strategy. If things get too hard, dangerous, frustrating or hurtful, they can easily take their skin out of the game and return to a life of comfortable indifference in a way that I cannot. But I know it’s not the responsibility of the oppressed to end their own oppression. People of privilege must relinquish it willingly. The lesson: I can’t control when people change. They have to change and grow on their own. Let people do what they can from where they are. Davis said history is not about the past, it’s about our future. Over 50 years ago, the thought of a Black president was only a dream of a distant future. In order to make that dream come true, Black people had to secure their right to vote, their access to education and their right to mobility. This wasn’t easy and these social changes probably made many people–white and Black alike–feel very uncomfortable. But out of that discomfort grew a more equal nation with more freedoms and opportunities for all. We’re on the horizon of another dream future but it requires this generation getting up and out of our comfort zones, interacting with different people, challenging our beliefs, expanding our networks and speaking freely. The lesson: Change happens outside of our comfort zones. Build a diverse community. We need each other. Davis mentioned to loud applause that we’re still living in the immediate aftermath of slavery. The end of slavery didn’t mean the end of struggle for Black Americans. The laws changed, but the racist thoughts and fears of most Americans stayed the same. Our culture only began to slowly change when we all changed our opinions about each other. Now, we face a President who’s about to undo all of the progress we’ve made by feeding off of the archaic opinions of a few Americans. But we can fight against it the same way we fought against laws of the past: by moving forward in spite of them. The lesson: Changing presidents, changing policies and changing laws won’t change anything until we change our minds. This weekend, my best friend listened to me explaining why I was so exhausted by the events of this inauguration weekend. She said to me, “You spend a lot of your time thinking about people and race issues. I don’t want it to overwhelm or consume you.” But after thinking listening to Angela speak I realize I am still overwhelmed. But not with sadness or anger. I’m overwhelmed with empowerment and encouragement. I have picked up the baton from the great freedom fighters like Angela Davis and John Lewis and more. The lesson: I have to get up and try my best. Thankfully I have lessons from these greats to encourage me along the way. 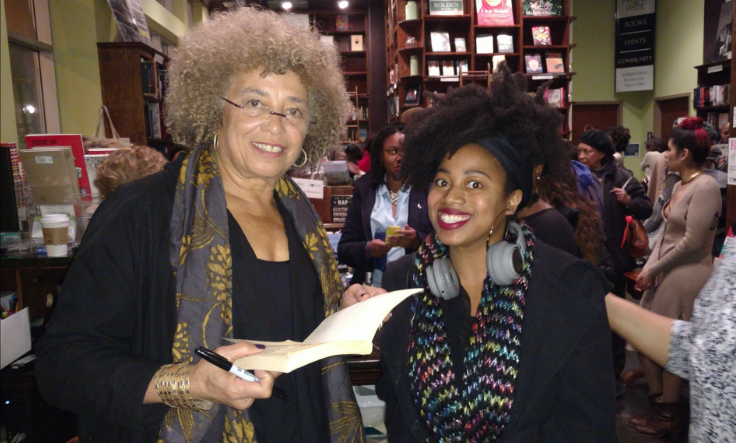 Jolie and Angela Davis at her book signing.